As we have mentioned in the past , we raise a lot of our own food here at Fernwood. Along with the rows of canned vegetables and fruits lining the pantry shelves and the freezer bags full of blanched greenbeans, broccoli, and swiss chard, we round out our supply with the chicken, lamb, and pork we raise. Yesterday, it was time to process the meat birds we had bought as chicks back in June. 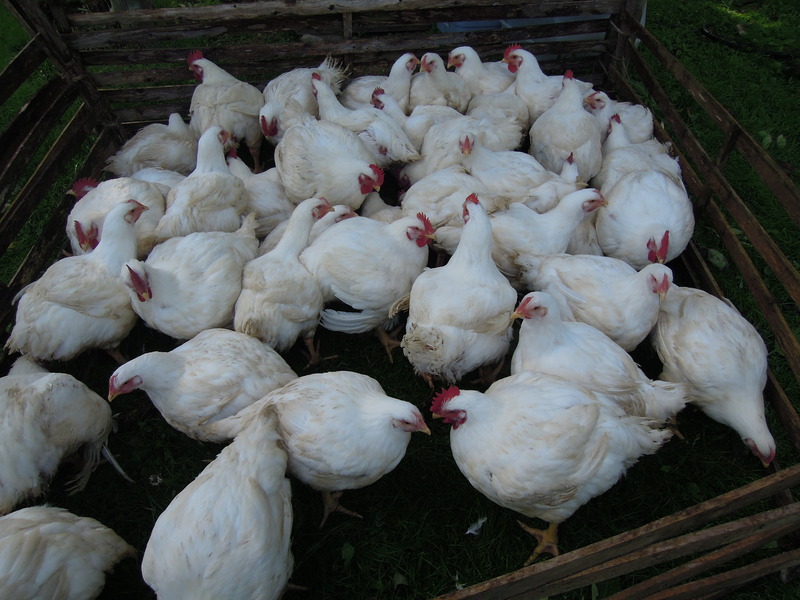 Our system for processing chickens has become fairly efficient over the last few years. We always process our own birds, opting to not send them off and have a butcher shop do it for us. It’s the same with the lamb and pork we raise. We raise them here on the farm and see the process through to the end. It’s a choice. Most often, we share the work with another farm who also raise their own critters for the table. Many hands make light work, as they say. We process their birds on one day and the next day we are back here processing ours. Having the right set up for efficiently processing 70 meat birds is crucial. We start by making sure that the eviscerating table is set up, the knifes sharpened, and by keeping a big pot of water heated to 140 degrees. Once the chickens are killed, they are submerged in the hot water to loosen their feathers, then they are ready for the plucking machine. 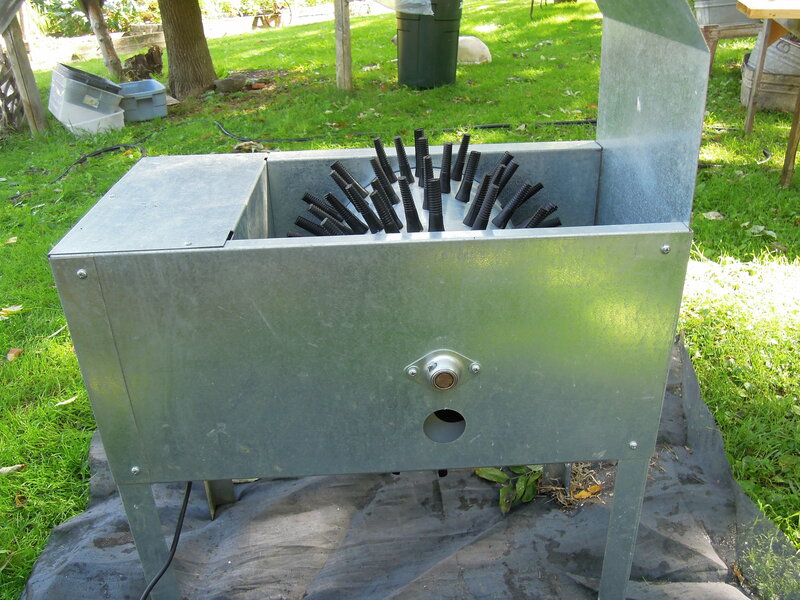 The plucking machine ( ours is a Picwick) is worth its weight in chickens and feathers. It saves us a huge amount of time. With the plucker, a chicken is defeathered in about one minute. We are very thankful for the chicken plucker! The chickens go from the plucker to large sterilized buckets filled with ice water. This cools them down and gets them ready for eviscerating. Once the birds are cleaned out, they again go into sterilized buckets of ice water. We chill the birds in ice water for 24 hours, changing the water several times, before bagging them for the freezer. Everyone has their job, and we tend to keep our ‘station’ through the whole process. I am usally running the plucker. Rick and our friend Len are usually at the eviscerating table. We’ve also had the help of our friend Rick H. , who before he began helping us pluck and clean chickens, had a lifetime career as a surgeon. He’s a very thorough chicken processor. We are very glad to have his help and he will usually take payment in the way of a chicken……and often some livers. The chicken plucker was bought between three small farms ( ours being one of them), and this helped with the initial cost. Now, all three farms have use of the plucker, and most often the help of many hands. Pluckers are pretty pricey and there is no real sense in each farm owning one, unless they specifically raise chickens as a cash crop and are processing on a regular and continued basis. It takes us about 2 1/2 hours to process 70 birds. Not too bad. As long as we continue to have meat in our diet, raising this meat from start to finish, keeps us very mindful and appreciative as to where the meat comes from. We are also committed to raising our animals in a healthy and humane way. We are always grateful for all of the food we raise and how it helps to sustain us. We truly give thanks. Always, after this big chore is done, we all sit down to share a meal. This is one of the best parts of sharing farm labor. The mid day meal. Always a treat after a job well done. 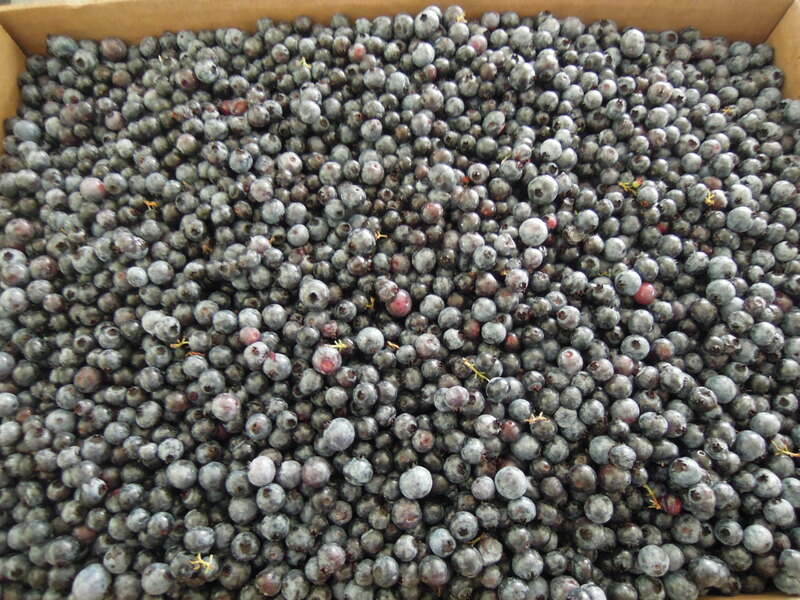 Yes, blueberries…….and now a winters supply stored away in the freezer. Harvested by two different friends, and raked from their own organic fields. Nothing like Maine blueberries! But also, 75 skeins of yarn from our Blue Face Leicester sheep. 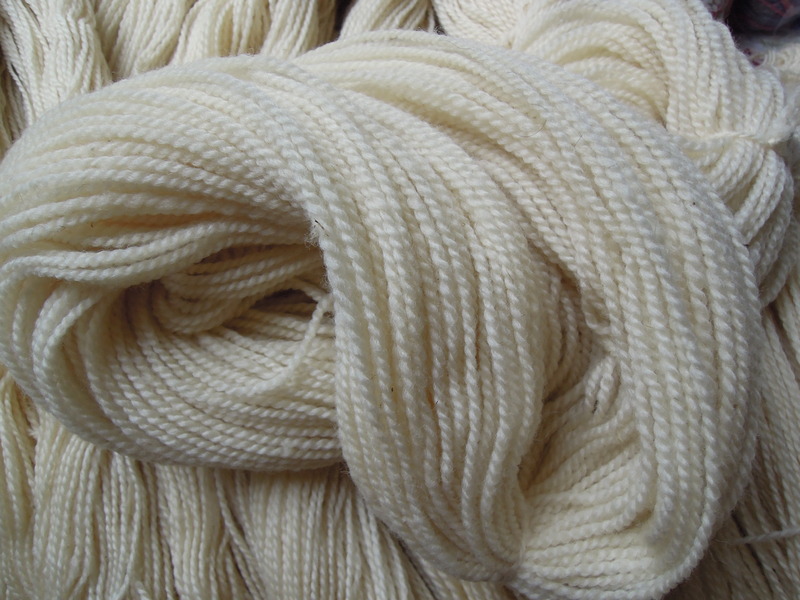 This year, unlike any other, we sent 30 or more pounds of fleece to have processed into yarn. The decision being made as a result of gorgeous fleeces piling up and only having the ability to handspin just so many. A whole room of roving awaits for just that, so spinning will not cease and handspun yarn will still be offered for sale. 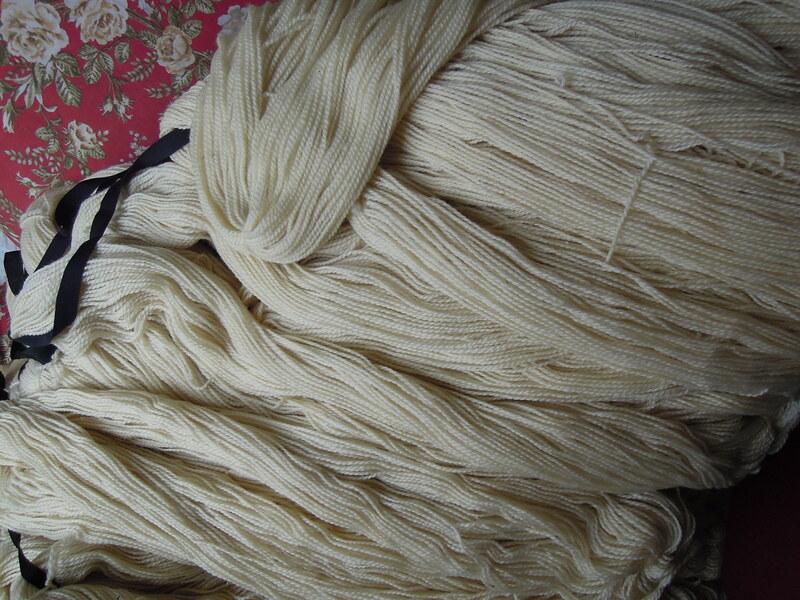 I sent the fleeces off to the Battenkill Woolen Mill and they did a fabulous job. 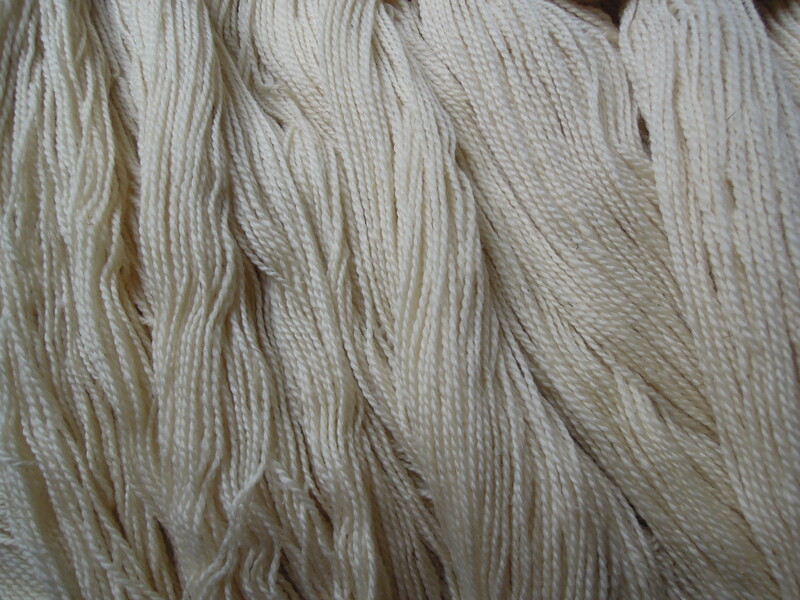 Now….lots of yarn to dye and lots of yarn to sell. If you are interested in beautifully lustrous and soft Blue Face Leicester yarn, contact us here at the nursery to purchase skeins. 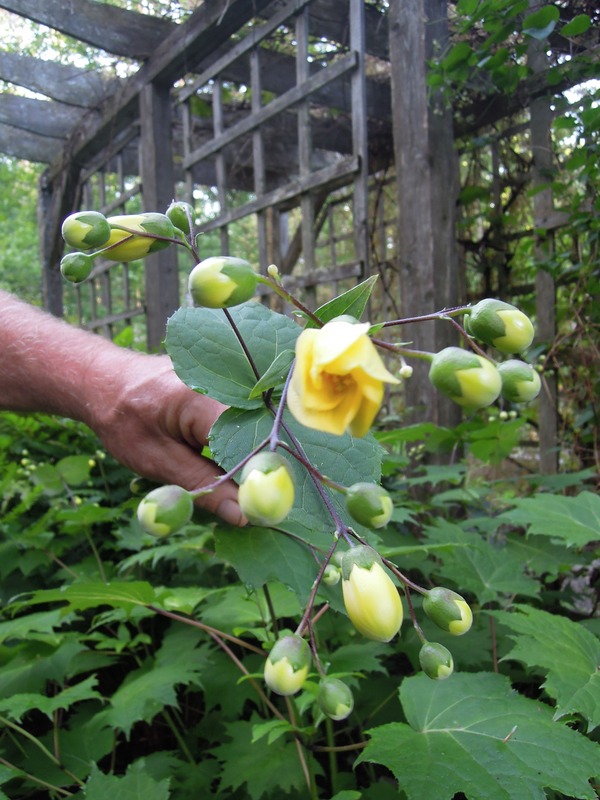 ( fernwoodnursery@fairpoint.net ). I am thrilled to have all this yarn to dye, and with fall approaching……that’s just what I’ll be doing! Umbrella leaf, Diphylleia cymosa, is a great addition to any shade garden. 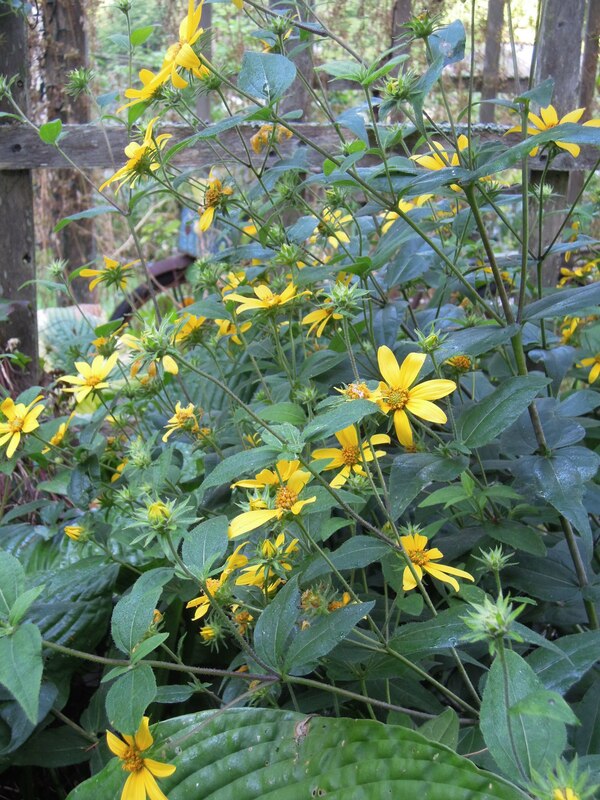 Standing at 3' high and as wide, this Appalachian native makes an impressive statement throughout the season. 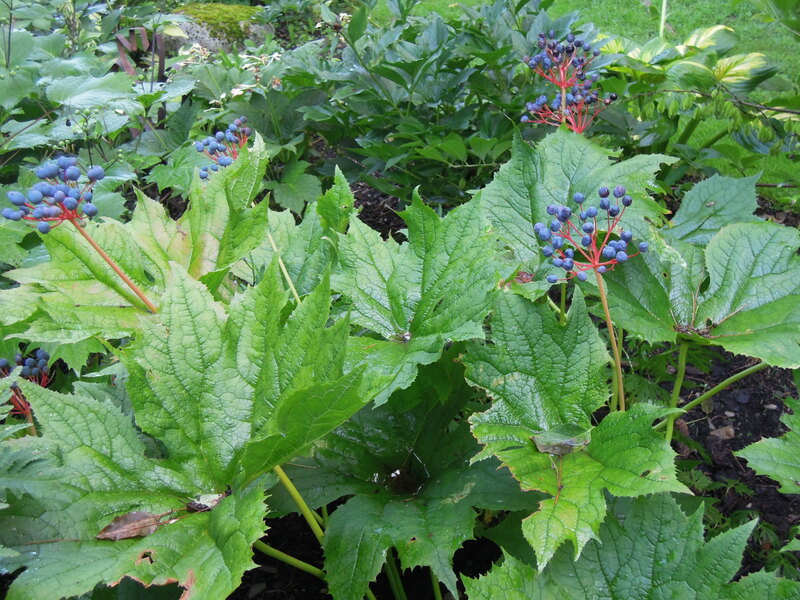 Large leaves up to 1' across, white flowers in late spring, and cobalt-blue berries on red stalks in late summer, complete the show. Rare now in the wild, it prefers a moist shady site that is protected from high winds. 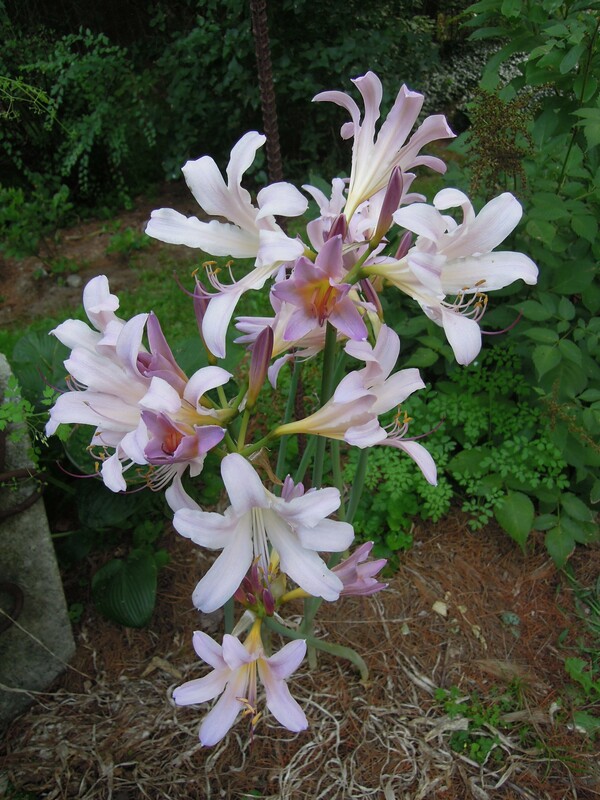 Though listed as hardy to zone 6, we have grown it for many years with no overwintering problems. Growth rate is moderate, taking about 3 years to reach full size. We've had no major pest problems, and only a few holes from snails and slugs. 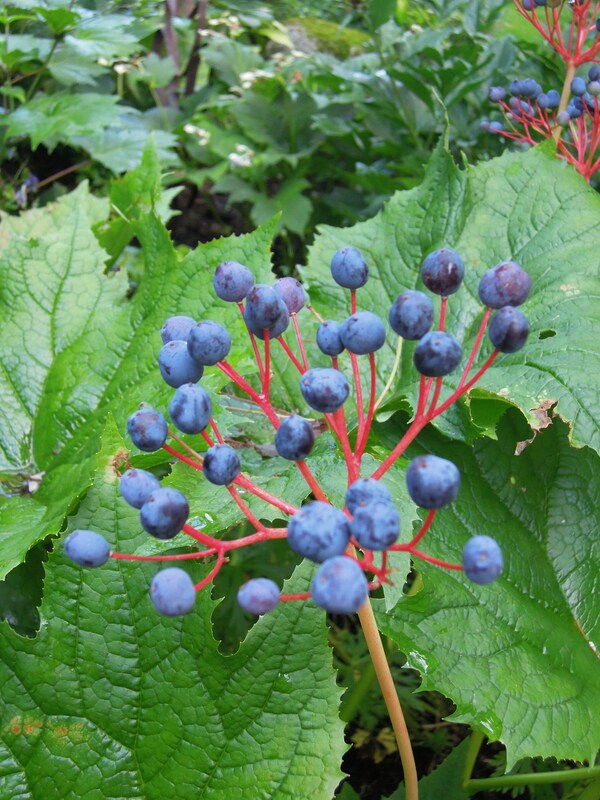 Right now the berries are at their peak and draw the attention(and many questions) of all that see them. 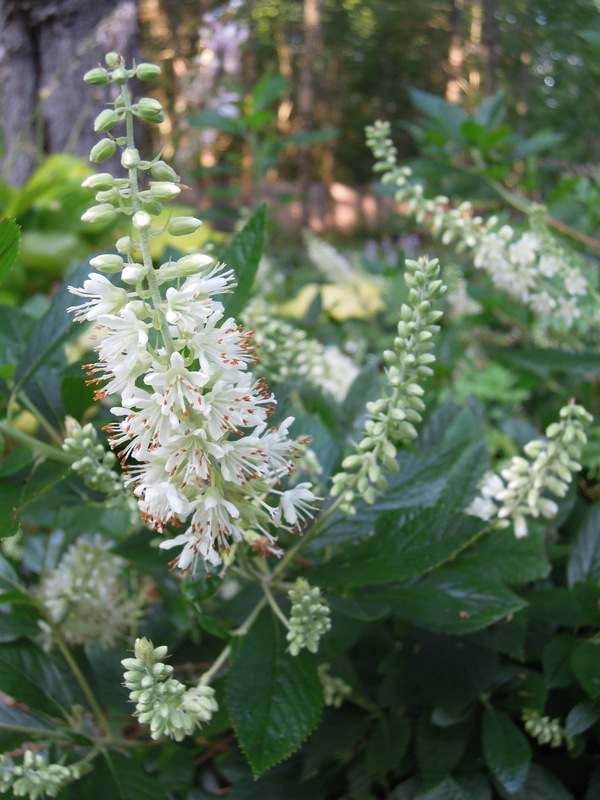 So if you have a moist shady spot in your garden, give this american native a try. 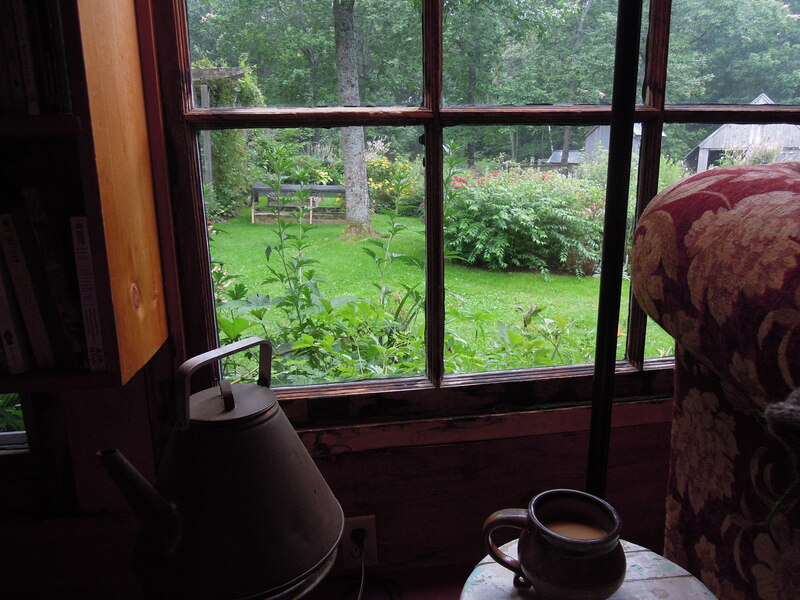 I am in the kitchen: through the window, the long grasses run before the wind, and on the table are mounds of greenbeans. Water is boiling on the stove; steam makes the lids dance and rattle. My knife flashes, chops, and my hands follow each other fluidly through familiar choreography. In the garden, the onion tops have collapsed in a soft tangle. It seems only yesterday that I planted the tiny sets. There is a peculiar satisfaction in the swiftness with which I pluck the onions from the soil and lay them in the golden ranks to cure. Twist and pull the corn ears, tuck them under my arm. Shuck them in the garden and throw the husks to the horses. As the light becomes lower and richer, I feel a gathering sense of fulfillment and loss. It happens too fast. Yet in this speed, this urgency that inhibits reflection, in the busy-ness of living, in the demands of vegetable growing, I am absorbed by the life of this particuler soil, this particular air, and this particular light. I become a thread in tha tapestry of summer, even as I am torn by the desire to stand aside, the need to arrest this tumbling beauty, to hold it in my hands. Some fine words to share by Beth Powning. Isn’t it wonderful when we find words that can so eloquently and thoughtfully express a time in our life, can capture moments with just the right feeling and emotion. Summer and her great bounty is exactly what’s happening now. It’s a flurry, and the pace of the days and the swiftness of how quickly it all happens stuns us. We , who are always so busy this time of year, managing the nursery and growing our food, are acutely aware of how fleeting summer is. One more swim at the lake? Another picnic up on the ridge? Another paddle across the pond, please? We’ll do our best to make time for a few of these idyllic summer pleasures. We will be glad we did, come February. Just as we will be grateful for that rich tomatoe taste from the canned jars that line the pantry shelves. A bit of summer captured in a jar. We are early risers. Rick makes his way downstairs by 4:30-4:45 am, makes coffee, and starts a list for the day. By 5:00, I am awake. I smell the coffee brewing and also head downstairs. We love early mornings. The stillness, the quiet, the slow greeting to a new day. We know what awaits us in just a few hours and are grateful for this time to settle into the day. Lists get made, dishes in the dry rack put away, we putter around attending to tasks that allow us to move through the morning in a quiet manner. I often sit for a bit ( appreciative to the coffee that has already been made) looking out the big front windows and working a few stiches into my latest project. 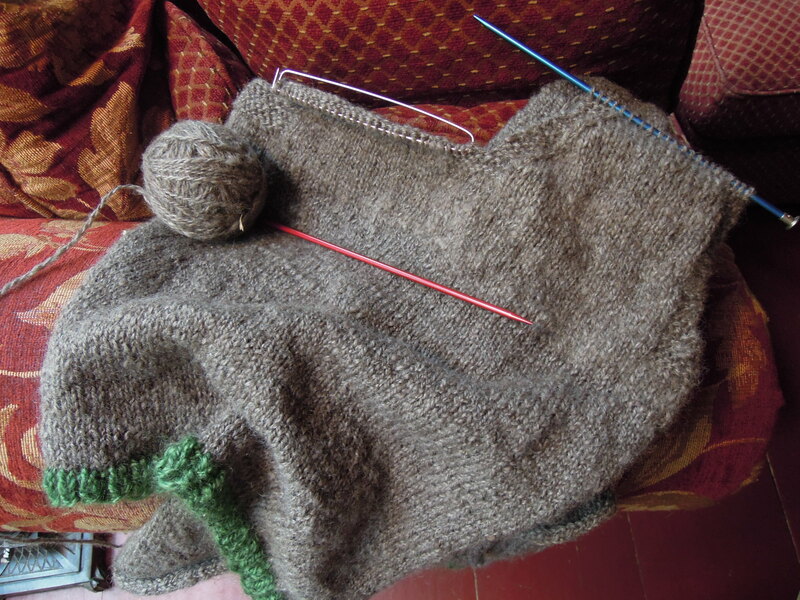 Currently, a simple vest with yarn spun from our old beloved sheep, Ruby. Ruby was the last of our colored sheep, a Blue Face Leicester with a honey colored fleece. Thankfully, I still have two bags of roving from Ruby that need to be spun, and I think of her sweet personality everytime her wool passes through my hands. Oh, these early mornings, a simple gift. 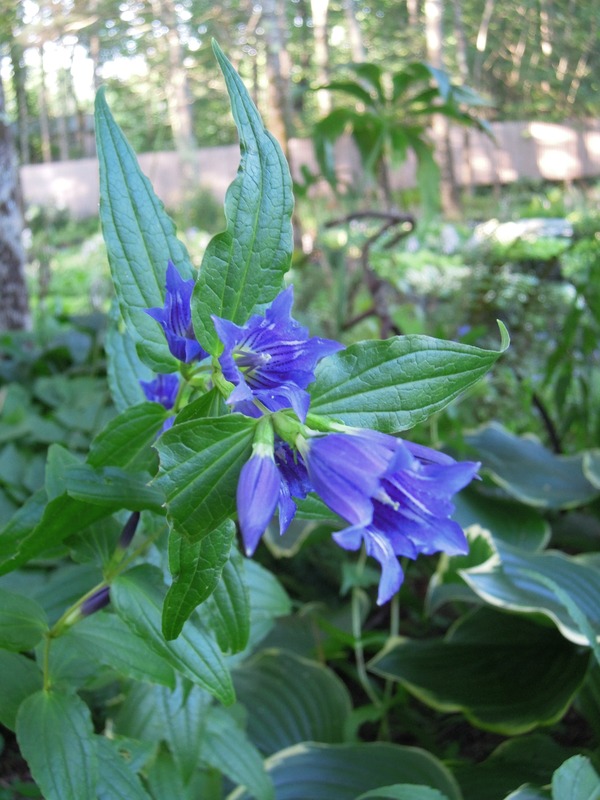 Frequently, usually after the 4th of July, we are asked if it is too late to plant perennials and woody plants. It seems that many people believe that spring and early summer is not only the best time to plant, but the only time you can plant, and be successful. 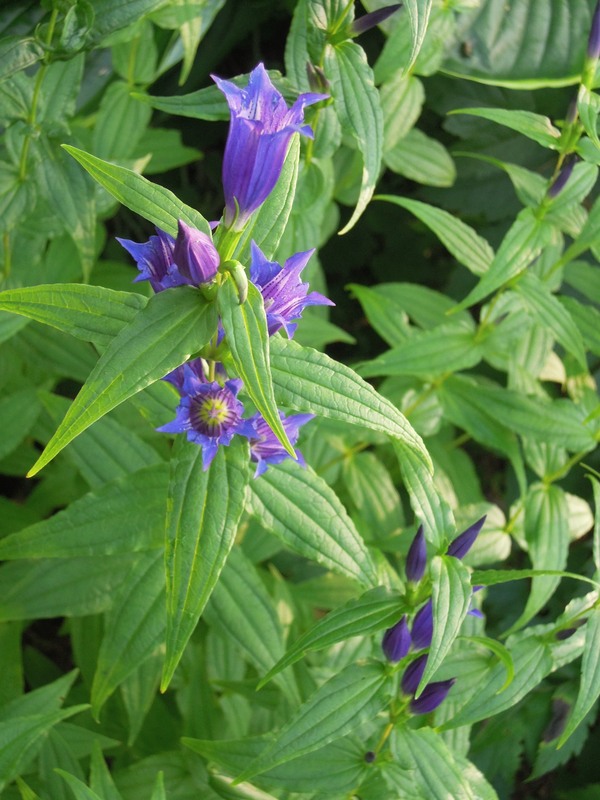 The truth is, now through September, and even into October, is an excellent time to plant. Right now you can see your garden in full growth. If there is any editing to be done, you can see what needs to be moved, divided, or even if new plants should be added, without relying on memory next spring and before things emerge at that time. 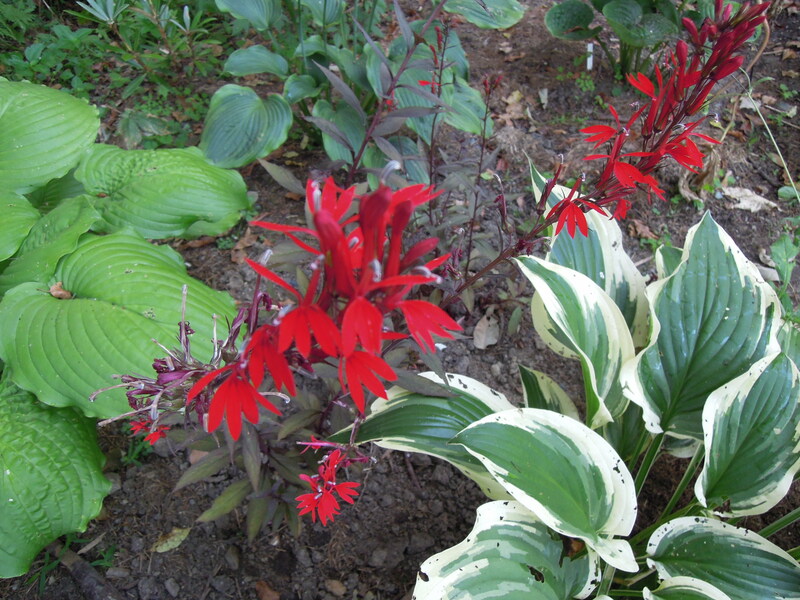 Any color or texture combinations you might change or create are easier with the foliage still up on the plants. 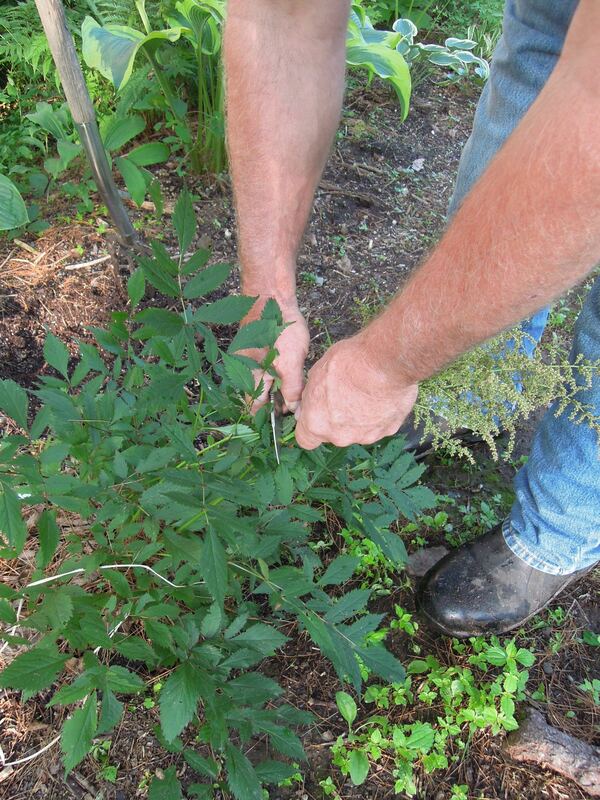 As the temperatures start to cool, and with light to moderate water needs, the plants are fairly easy to to care for. With most of the growth in foliage done for the season, the plants put more energy into putting on new roots and forming larger crowns. 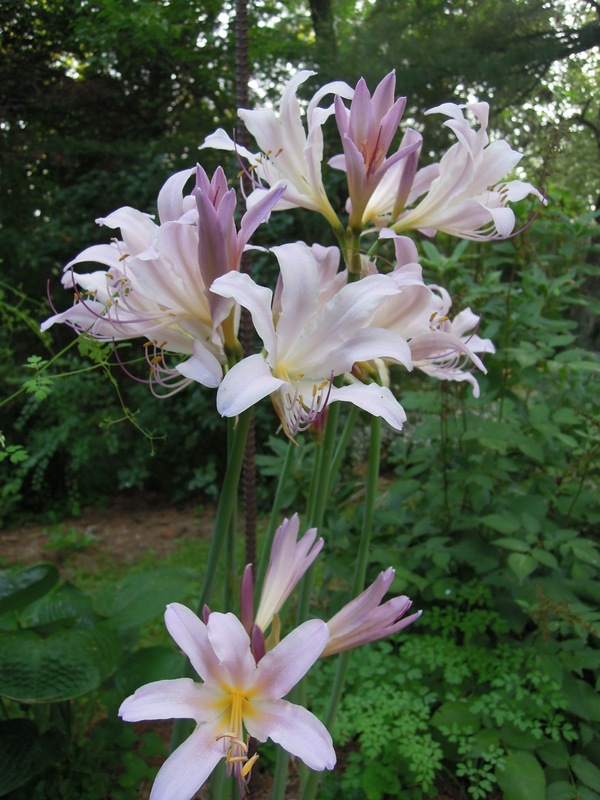 This makes for a more established plant for the next year that is apt to be more mature with bigger size and more blooms. 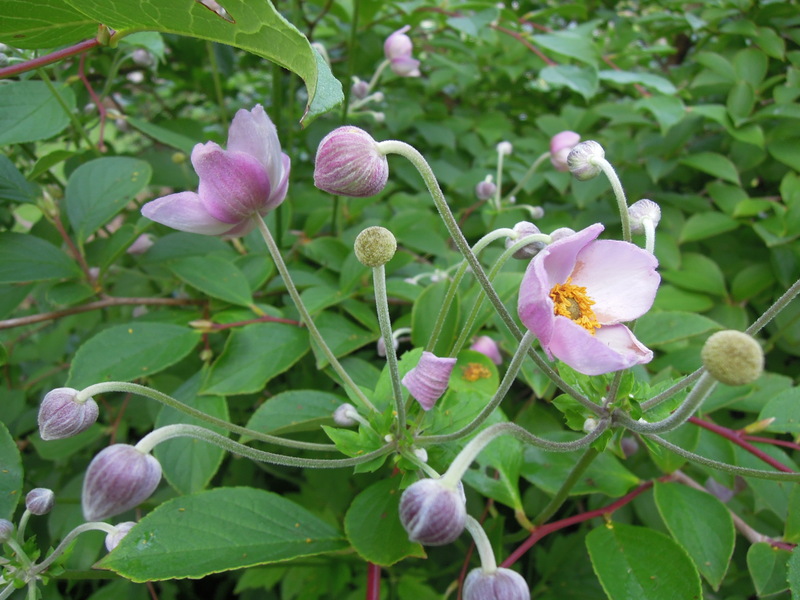 With the exception of those that prefer to be handled later in the season ( example: hellebores, peonies) we are presently dividing our plants into containers for this fall and next years sales, and will continue to do so into October. Most of the display gardens here were planted towards the end of the season because one; we have more time then to do so, and two; they will require less maintainence from us for the remainder of the growing season. The biggest advantage being that we can see what changes need to be made. 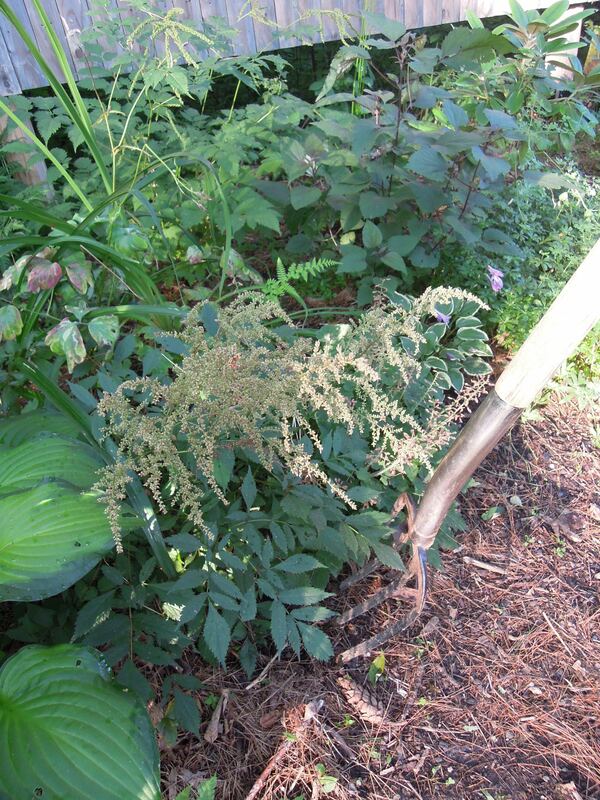 For an example, we have a variegated Cimicifuga that is being crowded by one of the large Veronicastrum. This will be dug anyday now and moved to a different location. 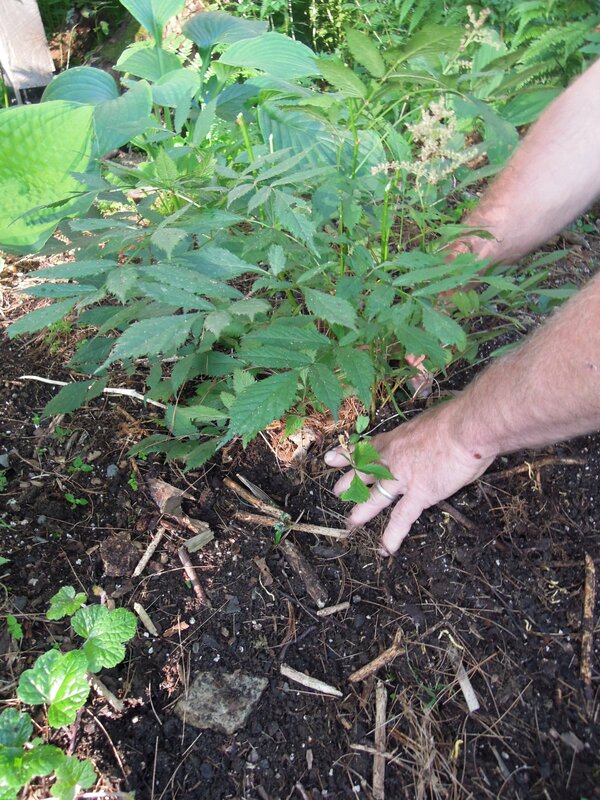 It’s best not to transplant if it is a really hot day, better to do this in the early morning or late in the day. Always water plants well after transplanting and make sure they don’t dry out, but do not over water and saturate the plant. Many people are visiting the nursery for the first time this season to buy plants for their late summer and fall planting. Some are even planting entire new beds that they have spent the summer designing and getting the site ready. So if you have the time, there is still plenty of opportunity to plant. Earlier this week we made a trip to the coast. While hiking along a trail in Pemaquid, we came across this sign. 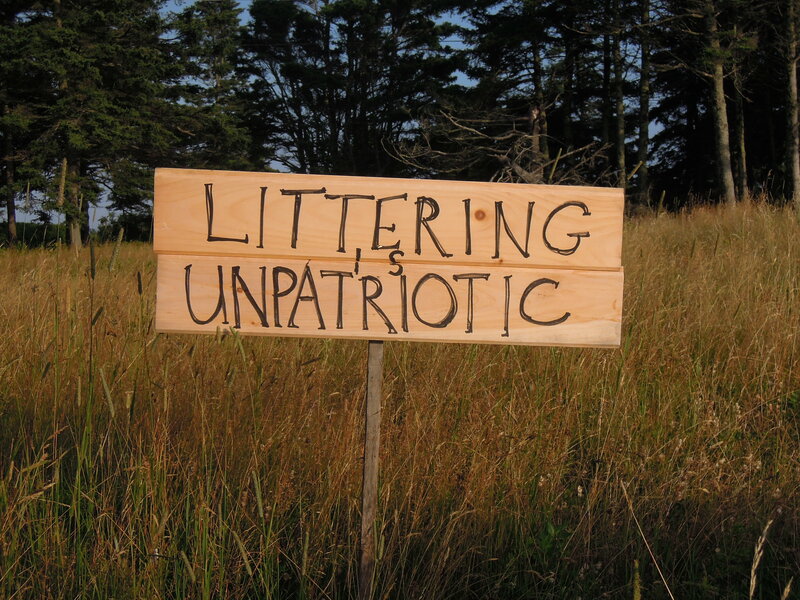 Yep, littering is just not nice, and the trail we were on was pretty darn clean. Good job, sign! We stopped on the way home at the Island Store in South Bristol. If you’re traveling that way and want some good eats…this is the place to go! Lots of homemade salads, sandwiches, and baked goods. 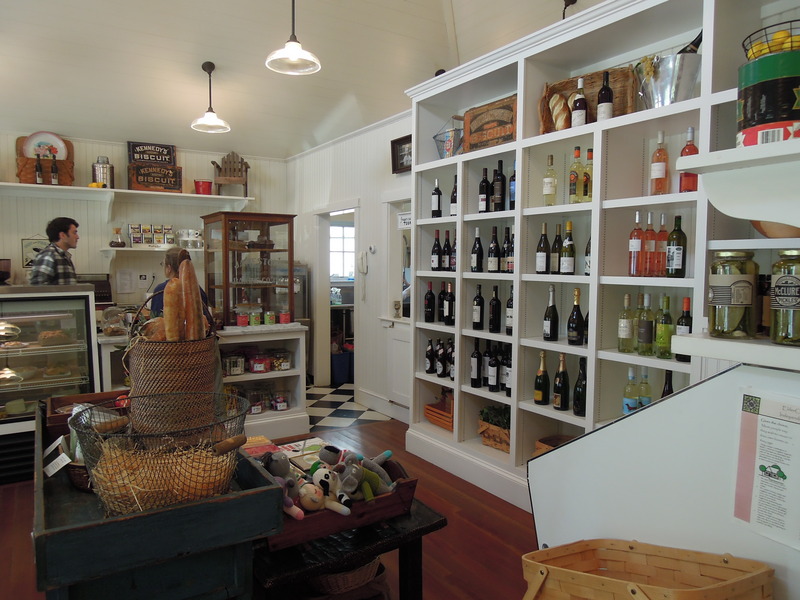 The shelves are stocked with other goodies…fresh bread and produce, condiments, treats, and a terrific wine selection. It’s a nice store to be in. 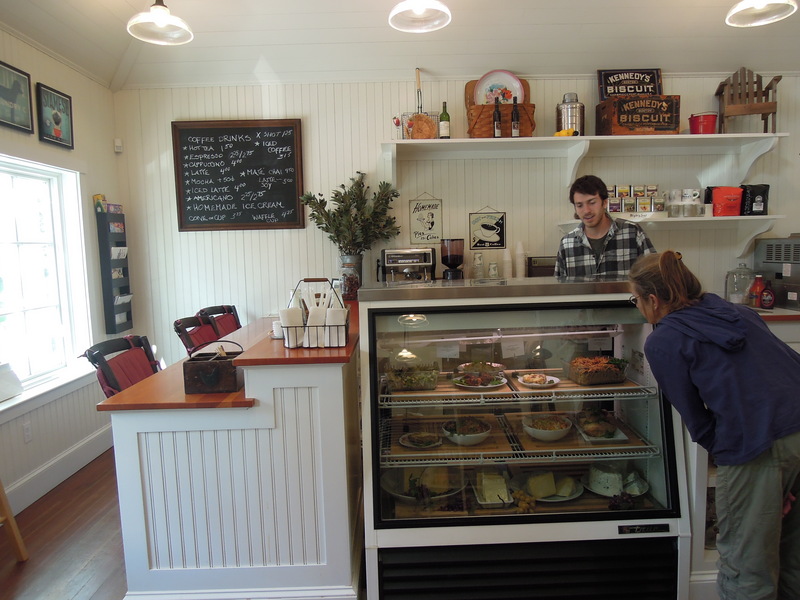 The space is lovely, and the owner, Beth Fisher, is very welcoming and friendly. Beth sells beautiful linen aprons in the store. She was wearing one that day ( which looked terrific), and yes, I did have to bring one of these home with me. 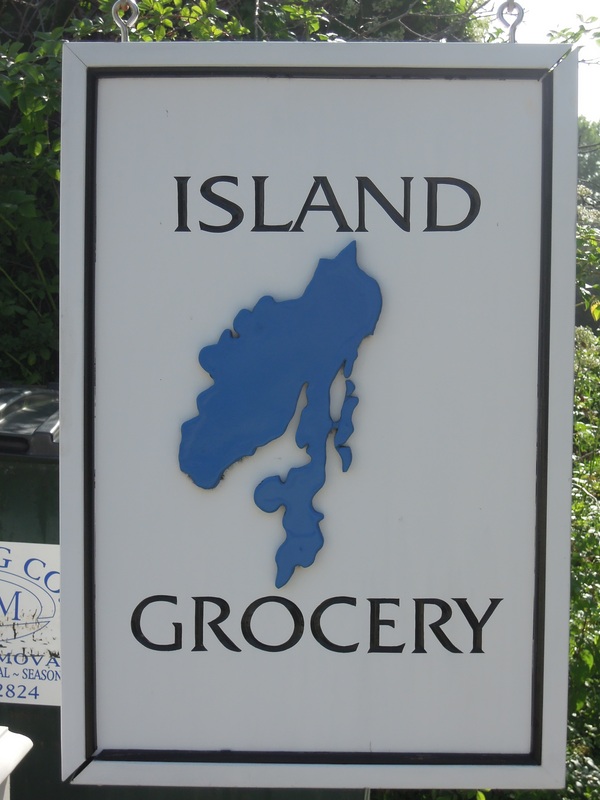 Surely you’ll want to visit the Island Store! Then, a nice leisurely ride back to the home place. The gardens here are lush right now. 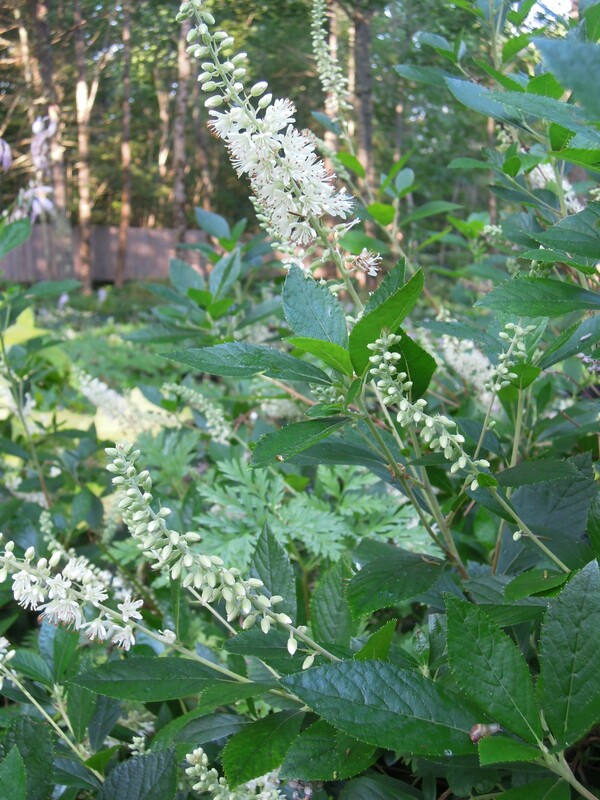 We are really enjoying two of my favorite plants…Cimicifuga racemosa and Veronicastrum virginicum. 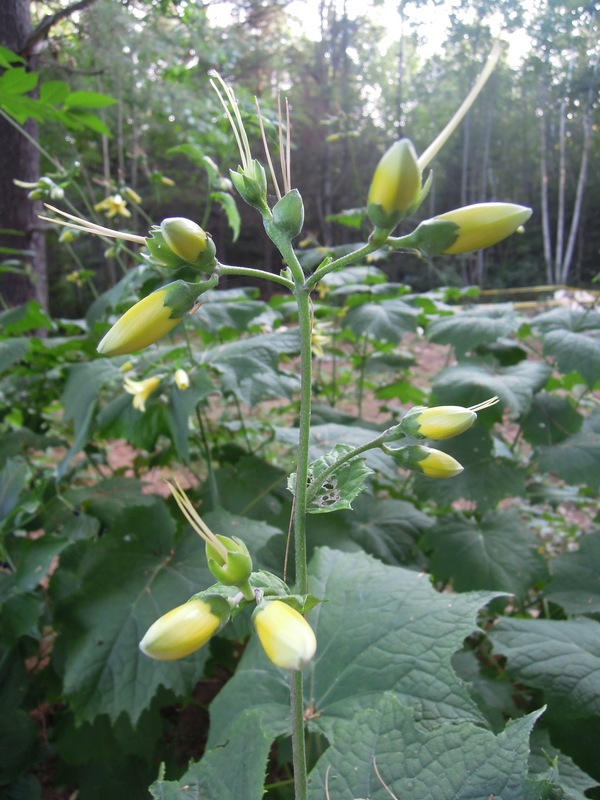 Both plants are loaded with pollinators and their blooms reach above most everything else in the garden. We’ll try and get a few photos of both plants and share them on the blog. In August, we become very busy dividing and propagating. This is an excellent time for both, and it’s also a good time to edit the garden. Some plants needing to be moved and others added to the garden. The work continues, as well as the absolute enjoyment of it all! 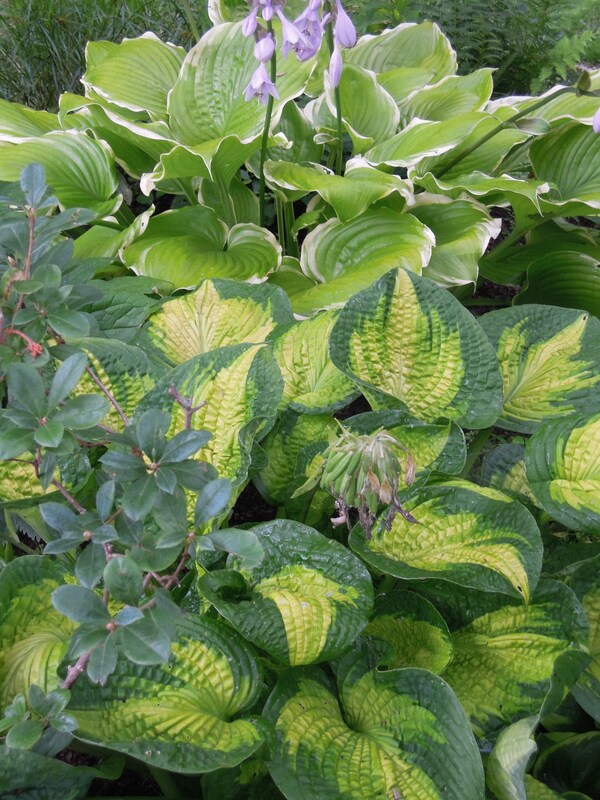 Below a photo of two great hostas in the garden, it’s been a terrific summer for hostas. Just the right amount of rain and cool temperatures.